The Sandbridge Junior Lifeguard Camps are getting bigger and better every year. Water safety instruction for over 400 youngsters and raising over $30,000 for “A Dolphin’s Promise” are great ways to celebrate our seventh year! It is hard to believe that in 2011, an idea to expose our kids to ocean water safety would turn into a successful annual event. As a local resident raising two young boys on the beaches of Sandbridge, I knew education was the best way to protect our children and instill respect for the ocean. Currently, there are six Sandbridge lifeguards who graduated from the camps and are working on our beaches and training new up-and-coming junior lifeguards: JP and Jill Eberhart, Jack Kirschner, Evan Mungin, Nick Tottossy, CJ Kaiser and Grady Bryant. 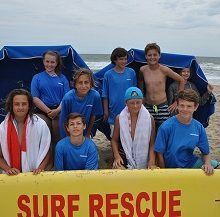 Thank you to the following for their continued support and efforts with our Junior Lifeguard Camps: Sandbridge Life Saving Service, Sandbridge Market, Sandbridge Island Restaurant, Judy Donahue and Donna Russell. All the best and enjoy the rest of your summer!